Vladimir Badirov Project - "Greeting From Nostradamus"
The sound is very much in the possible vein of world music, although it spans other avenues also. It could really be termed as world music. The CD has a very earthy feel, and is of a mostly instrumental content. 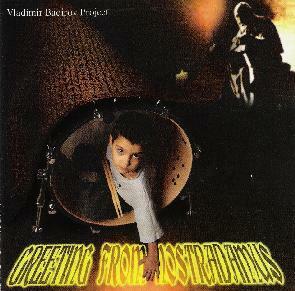 And as Vladimir is a Drummer/Percussionist/Programmer this CD makes for an interesting listen. Vladimir is joined by a host of other musicians playing an array of different electric and acoustic instruments, and I find that on the whole it has a very soundtrack style to the sound. It has some fantastic Nay (Flute) playing, and Guitar technique on an early track, and every other instrument playing around this really does have a top quality sound and skill to it. I hear elements of Latin Jazz, ethnic style beats, and a host of other cultures intertwined perfectly within the framework of sometimes heavy, sometimes mellow, almost rock, almost Arabic, and really I can find no similar names to liken this too. I can only try my best to describe it. Throughout the CD the mood can change suddenly, and it can jump around between styles. For instance, on the track "Shaman" you on one hand have a manic funk rhythm with Trumpet solos and in the background there is a Jews Harp. Suddenly it mellows down into what sounds like a classical Violin piece, Drum & Bass style, building or rather bursting back into manic Trumpet Jazz, but it works. There is also some great Ud and Sato (Violin) playing on a few tracks, and they are also melded into a peculiar vibe. There is also some interesting native style American Indian type chants, or some other culture, which make this album stranger and more abstract. I find that the merge of culture, with rock'ish riffs, percussive samples, and live acoustic instruments, are done in a way that I had never really heard done as the Vladimir Badirov Project do, and I find this very refreshing. I could not say that I am a big fan but I am definitely enchanted by the diversity that I hear, and by the quality of the instrumentalists involved. And even though I cannot describe them sufficiently, I find that they have something to offer in this field of music. As I said, it is very soundtrack sounding, and sometimes very orchestral, but at others it is rocking or jazzing, or even funking. It is a film all in itself, and it takes you through from start to finish in a progressive manner and leaves you thinking what was that about? But I sort of liked it! For more information you can visit Vladimir Badirov Project web site at: http://www.badirov.com. Visit the Unicorn Records web site at: http://www.unicornrecords.com.